Mamang Dai is former civil servant, journalist and poet from Arunachal Pradesh. In her writing she gives us a glimpse of a tiny corner largely unknown to the outside world. She writes, “In our language the word ‘pensam’ means ‘in-between’. It suggests the middle, or middle ground.” In the narration, pensam is literally the middle-ground between myth and reality governing the lives of Adis, and also the transtionary phase between the traditional and modern ways of their life. Mamang also suggests that in the world of these beliefs anything can happen and everything can be lived. As if to substantiate this, she starts the book with the story of a boy, Hoxo, ‘who fell from the sky’ and was carried by Lutor to his village. Lutor and his friend had been drafted to work on a massive road project by the ‘migluns’ (the British) across the Siang valley. When they return after 3 years, they bring along a basket containing the child. Lutor’s friend tells the villagers, “There was great noise and fire in the sky and our son fell to earth.” Accepted by the tribe unquestioningly, Hoxo goes on to lead an eventful life and play a key role in the stories that unfold. In the last story, the aged Hoxo is shown spending time with an antique pair of binoculars with his granddaughter. The stories in between take the reader through a fascinating ride over a long period of time and tribal beliefs, from the legend of the origin of the tribe to modern times of development that throw their lives and customs into disarray. The Legends of Pensam is a set of stories interconnected across a few generations of a family that makes the book more of a novel. There are a host of memorable characters steeped in traditional tribal beliefs and living vulnerable lives influenced by spirits, shamans and unnatural events. “People have premonitions – women dream dreams, babies are born who grow up unnaturally fast, like deer or lion cubs.” A fisherman has a vision of Biribik, the monstrous water serpent and as everyone could have predicted dies within a year unable to recover from the aftereffects of that terrible vision. This also augurs that something unexpected was bound to happen. So no one is surprised when Hoxo’s father, Lutor, is killed in a hunting expedition mistakenly shot by his own friend. Such deaths are accepted as being caused by displeased nature or spirits. Like the majority of tribes inhabiting the central belt of Arunachal, the Adis practice an animistic faith that is woven around forest ecology and co-existence with the natural world. Under the malign influence of spirits anything can happen in a life – persons get unnaturally killed in hunting expeditions, children suffer strange illnesses, houses get gutted in fire, husbands go astray. These things happen because certain rites are not performed by people of this or earlier generation. Shamans play an influential role in the tribe as they have the power to exorcise the bad spirits and restore some order in life. The stories also recount historical developments in the tribal area which was opened up to the world in the 19th-20th centuries. In 1911 a British political officer, Noel Williamson, who had been working among the tribes for two decades, set out on a mission to explore the course of river Siang flowing through the territory of Adis. An angry Adi struck him down in the village of Komsing. Though the exact cause for this was not known, some believe this could have been due to seduction and romance between a local woman and a Britisher that led to this terrible punishment in retaliation. Not only Williamson but 48 of his accompanying sepoys and coolies were also killed. This massacre resulted in a punitive expedition by the Britishers in 1912, the Abor expedition, to capture the culprits and banish them to Andaman Islands. A memorial stone to Williamson was erected in Komsing where it stands to this day. After this the whole of Siang valley was opened up for exploration and several villages brought under British administration. Presence of migluns (foreigners) in the region had become common thereafter. After some years Nenem resigns to her fate and gets married to Kao and bears a girl. As time passes she derives contentment with what she has – a home, a husband and a daughter. Their village is ravaged by floods after a few years and they have to move to another place. That’s when she cannot take the pain and goes to the river one day only to suddenly collapse and pass away. In dreams, my people say, they see the rain mother sitting on the treetops, laughing in the mist. Her silver ornaments clink as she rides the wind, brandishing her sword. The Legends of Pensam makes a compelling reading both for its engrossing content and for its captivating language. One has to read it to fully experience it. 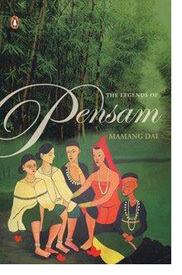 The Legends of Pensam is a collection of stories of three generations in a village in Arunachal Pradesh. It is a combination of legends and superstitions, which are intertwined with the lives of the village folks. The book is divided into four parts constituting the phases of evolution and growth of the village, the lives and loves of the characters, and their passage through the various stages of life. While each story is complete in itself, there is a basic link between all of them. The book begins with stories based on the first generation of villagers. The village is portrayed in the primitive age with residents sustaining on hunting and primitive agriculture. The two men who stand out were the chief, Lutor and the interpreter for the British officials, the father of Rakut. There are also myths and legends wound into the stories, though the narrative gets somewhat laboured on occasions. The second part begins with the setting up of an administrative unit by the British. A road is built and “civilization” enters. Two persons arrive from the outside world to know more about the village folks. They hear a few stories of the village and its people, participate in village activities and a feast, and then depart. The third part covers the second generation of people, now adults. They have their loves and marriages — some happy, others somewhat tragic. This leads to the appearance of the third generation. They receive better education. Some go out into the world and achieve academic and professional distinction. They then return to the village. Social and economic development leads to construction of a satellite township where the elite congregate. The link with the traditional past is not broken. Modernisation sets in. The fourth part leads to the aging and passing away of most of the second generation. The third generation enters middle age. A fourth generation appears, in its infancy. All this culminates in the final story — On Stage. The author exhibits amazing descriptive powers and paints a vivid picture of the denouement. Mamang Dai has done a good job in collecting these stories. She has woven them into a sequence through the relationships. The third and fourth parts have been very well written. The fourth part builds up into a good climax with the last chapter. Another notable feature is that she introduces a strong element of thinking in her characters in this part. The old people sit and ruminate on the passage of their lives. They think of the past and friends departed, and engage in some philosophic thought. All of these are skilfully interwoven into the whole fabric. What stands out is Dai’s descriptive ability. One can virtually see the green mountains, the flowing rivers – sometimes becoming raging torrents, the kitchen garden and the planting of paddy in the fields. Whenever she paints a picture in words she imparts a certain vividness and reality that few writers could achieve. It is very rare among Indian writers. Her choice of words is mostly simple. There is no superfluity. Her style is simple and concise. On the whole it is a very good read, leaving one with the hope to read more of this writer. IN many vernacular languages sprouting from Sanskrit,adi means the first, the beginning. The stories of the Adi tribe of Arunachal Pradesh encompassing myths, oral histories but echoing to the present as in Mamang Dai’s The Legends of Pensamexude the same kind of feeling, as if they have been flowing in seamlessly from time immemorial to this day. The word pensam has a special meaning too, as the author explains: it means “in-between”; a middle ground; “but it may also be interpreted as the hidden spaces of the heart where a secret garden grows.” Here nothing is out of the world, anything can happen. For, life is but a little boat that traverses through a gentle stream as well as a river in spate, and man has to accept it. The Adis are one of the 26 major tribes (not counting numerous sub-clans) of Arunachal Pradesh, formerly known as NEFA, lying at the foothills of the Himalayas and sharing international borders with Bhutan, China and Myanmar. Being adherents of the animistic faith, the Adis believe in co-existence with the natural world and the spirit that is part of the forests, rivers and the vales. Thus their stories reflect a half-revealed and half-concealed world, sometimes to be felt by the subconscious rather than seen with ordinary eyes. Violence too lurks behind the serene hills, true to Nature with its two facets. Witness the story about the sudden and mysterious death of Kalen, the hunter, or in the way Kamur, a perfectly normal man, suddenly takes up a dao (machete) and hacks his baby-girl and lunges at his wife (Pinyar, the widow). Later overcome with remorse at what he had done he asks for forgiveness pleading that he had no memory of those “black moments”. Though the people condemn him, they also know that “it was a nebulous zone that divided the world of spirits and men” and that “real could well be an illusion”. The mythical stories of the tribe is linked to the present by the presence of a city-dweller, or a high profile journalist &#151; a distraught mother of a child who suddenly stops speaking; she now travels to meet another woman like her in the far away hills (“The Silence of Adela and Kepi”) whose child also suffered from the same affliction `due to a spirit’ and in the process learns to accept it because `these things happen”. Legends of Pensam is a book of short stories which are interconnected so it doesn’t really give you a feel of reading separate stories. Every character and every story is intermingled.